Question: How Can I Use Graphic Organizers on Google Docs? Graphic organizers are a great tool for division one writing. As a Balanced Literacy trained teacher, I have used them in my writing program for years. As more and more of my students' writing moves onto Google Documents and Presentation, I have repeatedly wondered how can I use graphic organizers on Google Docs? I still see the value of using paper copies of graphic organizers and teaching students how to use them, especially with younger students. However, once they have experienced that strategy a few times I want them to sometimes compose straight onto a Google Document, with support. Using Google Document, or Word for that matter, shouldn't always be for typing a "good copy". 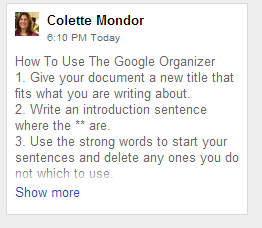 Please note that my students have a lot of experience on Google Docs. I created a Google Document that used the idea of a sequence organizer as inspiration. My students had used a paper sequence organizer a few times this year and I had an example of one posted in our writing area. I created a comment that is intended to give instructions for how to use the template (see how this worked in my reflection below). I used Doctopus to share the template with all my students. I had my students brainstorm, as a class, an event (we did St. Patrick's Day) in the form of a flow chart. I did this the day before the writing. As a class, we discussed some possible introduction and conclusion sentences. I walked my students through the steps of how to use the template I shared with them. I allowed student writing time. I stopped the class for a movement break and reminded them before they say "I'm finished", they need to revise for adjectives. We discussed some possible adjectives for the current writing activity. I allowed student more writing time. After class, I read my students' writing and gave each student two stars and a wish. I had my students read the feedback. 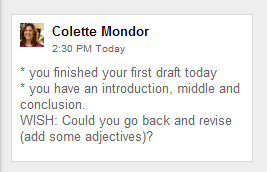 Students were given time to finish/revise their work and then could select "resolve" on the comment I left them. I printed/published student work depending on the format of the final product. Some of my students chose to do letters, some of my students chose to send emails. I was really pleased with how it worked. Students used the strong sequence words in their writing correctly. I circulated and made sure everyone had an introduction. 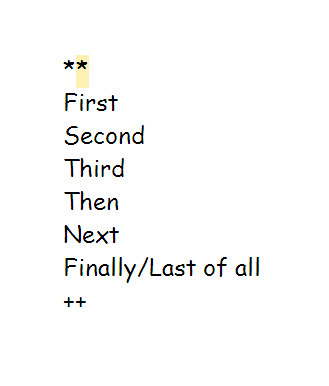 Some students used a capital letter to start the word after the strong word (First We went..), but that often happened when I did paper sequence writing on a sequence organizer as well. The one hiccup was that the comment I made in my template about how to use the "Google Organizer" did not transfer when I used Doctopus to create each student their own document. It wasn't really needed as I also went over the steps in person. I had two students away during our first writing session. I shared their Google Document with their families and invited them to work on as much of it at home as they were able to so that the student did not have too much to catch up on. One of the students was able to get the middle section completed so that all she had to do during the next writing session was the introduction and conclusion. Question: Will Other Organizers Work As Well? I'll let you know what I try out and what works! Please post a comment if you have suggestions or ideas!